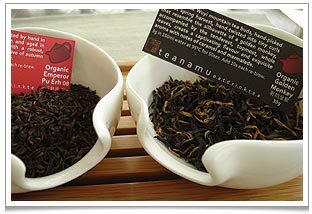 Organic Emperor Pu Erh 2008 Vintage (left) and Organic Golden Monkey Black Tea. Marvellous and extraordinary things are born from mistakes, as anyone who has been healed with antibiotics like penicillin can attest. Vinegar is another such ‘happy accident’. 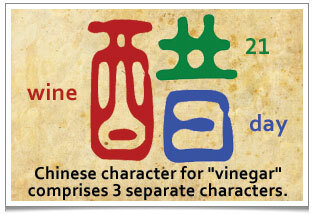 The Chinese character for ‘vinegar’ clearly hints at this: a composite of the characters for ‘wine’, ’21’ and ‘days’. And we can add to the list of accidental inventions superglue, microwave ovens, pacemakers, teflon, potato crisps, ice-cream cones, post-it-notes, even champagne! It’s just the same in the world of tea. 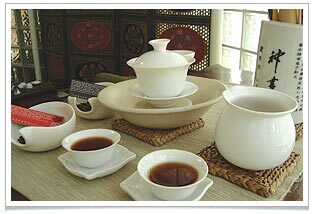 Lapsang souchong is a legendary example from Qing dynasty times. The ‘inventor’ (according to whose story you believe) was either a forgetful tea farmer who left his leaves drying by an smoky, open fire all night long, or a tea plantation owner in the village of “Miao Wang” (庙湾) in “WuYiShan” (武夷山) City, Fujian province who, under pressure from an army billetted on his land, had to hurriedly dry-roast his tea over heaped-up pine branches. Oolong tea itself was the product of a mistake or mishap. A tired and perspiring hillside tea farmer carelessly threw his newly harvested, tender, green tea leaves into his backpack, in such a way that the leaves knocked against each other and their edges started to oxidise. By dusk his backpack was giving off a wonderful new aroma that the farmer had never experienced before. Now the word ‘oolong‘ (乌龙 literally, ‘black dragon’) is used by the Chinese to mean any kind of error or ‘booboo’. Now, I’m not saying what follows is in the same league but I want to tell you what happened to me a few weeks ago. I was getting Chaya Teahouse ready for weekend opening when I carelessly added some leaves of Organic Emperor Pu Erh 2008 Vintage (a red tea) to a black tea Organic Golden Monkey and realised, to my horror that there was no way I was going to be able to separate them. They actually look very similar, a gorgeous black-reddish brown mixture with golden strands. I don’t know what rapid mental process I went through but I promptly decided to brew up the new, accidental blend. And it was rather good! Definitely worthy of being shared with my tea friends! Chinese character for ‘vinegar’ comprises 3 separate characters. I particularly liked the bright, mahogany-red hue of the liquor and the complex, slightly malty and earthy flavour of the Organic Emperor Pu Erh 2008 Vintage, with notes of caramel, marmalade and sweet longan coming from the Organic Golden Monkey. I christened the new tea blend ‘Emperor’s Golden Monkey‘ and even made it Tea of the Week at chaya teahouse. I did alter the proportions though – after doing a fair amount of tea tasting (the fun bit, you might say!) – changing the blend from 1 part red tea to 3 parts black tea to a 50-50 mix. Funnily enough, red and black tea are closely related, I always think, inasmuch as ‘red’ tea is called ‘black’ in Chinese (黑 ‘hei‘) while ‘black’ tea is called ‘red’ (红 ‘hong‘). Why? Well, it’s down to those seventeenth century tea traders. They found their cargo of green tea leaves had turned black during the long sea voyage from China to Europe, so they named the tea (which proved popular in Europe, especially with milk or sugar added) ‘black’. But the Chinese named the same tea after the colour of the tea liquor produced, i.e. red. So, in addition to the pleasant taste, I like the way my accidental discovery, Emperor’s Golden Monkey, is a mini-symbol of an east-west fusion!